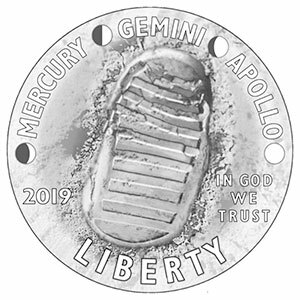 — The United States Mint has taken "one small step" towards the striking of new coins to celebrate the 50th anniversary of the first moon landing with the reveal of the design for its 2019 commemoratives. 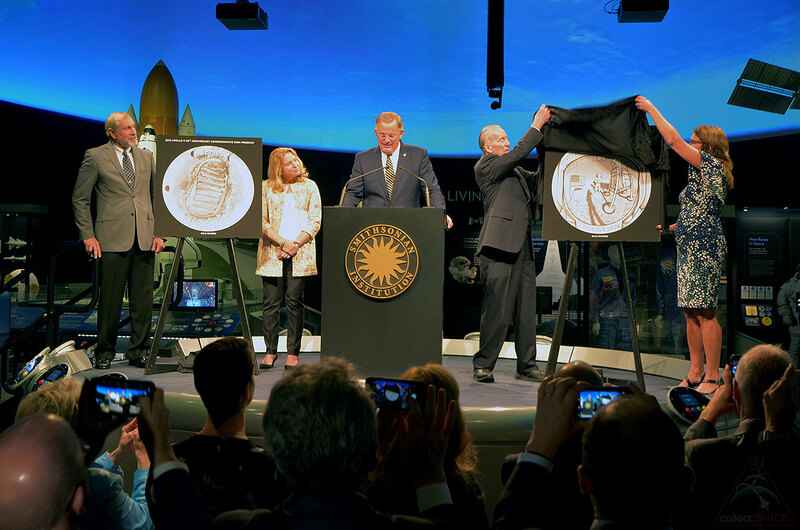 David Ryder, director of the U.S. Mint, presided over the unveiling, which took place at the Smithsonian's National Air and Space Museum in Washington, DC on Thursday (Oct. 11). "The Mint connects Americans through coins and next year it will be our great privilege to connect America to the extraordinary achievements of humanity's first steps on the moon," said Ryder. The Apollo 11 50th Anniversary Commemorative Coin program will see the Mint issue curved coins in gold, silver and clad metal. Congress dictated the design of the convex (dome-shaped) tails side, specifying it reproduce the reflection in Apollo 11 astronaut Buzz Aldrin's visor from an iconic photograph taken by Neil Armstrong on the moon on July 20, 1969. Mint sculptor-engraver Phebe Hemphill designed and sculpted the tails side. For the concave (bowl-shaped) heads side, sculpted by sculptor-engraver Joseph Menna, Congress directed the Mint to hold a public art contest, which was carried out in 2017. "The Mint offers hearty congratulations and thanks to artist Gary Cooper," said Ryder. "His winning design is a poignant representation of the triumphant moment that brought people together and reaffirmed our shared humanity and sense of purpose." 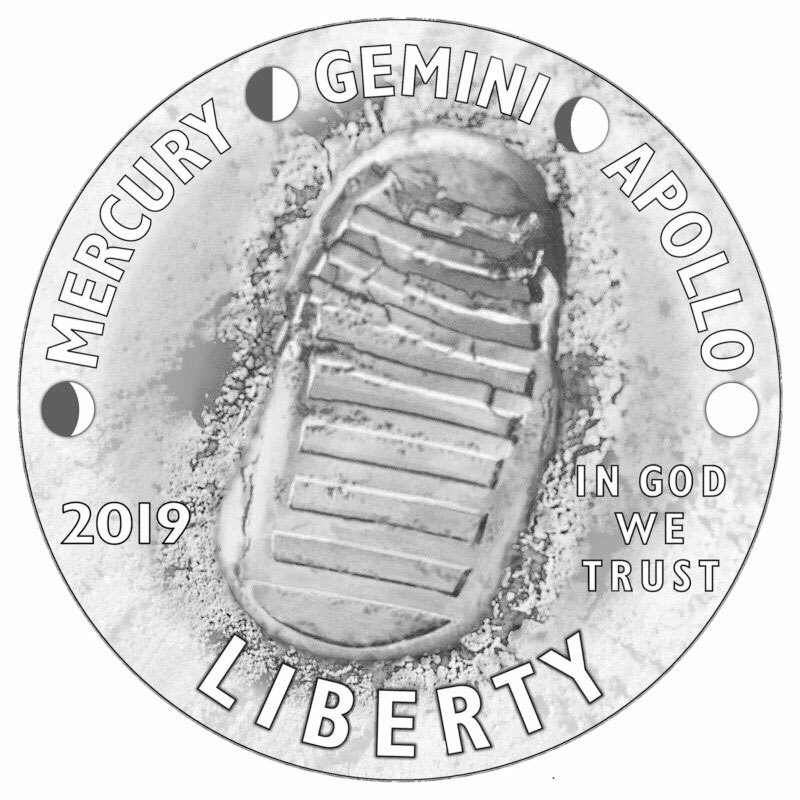 Cooper's design features the inscriptions "Mercury," "Gemini" and "Apollo," with each word separated by a depiction of a phase of the moon, and an astronaut's boot print on the lunar surface. Together, they are intended to represent the efforts of the U.S. space program leading up to the first moon landing. 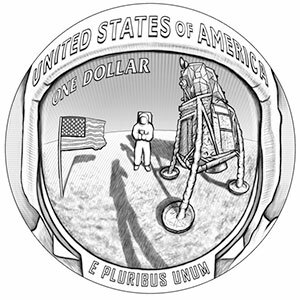 "The official U.S. Mint coin we are unveiling today, which kicks off the national celebration of the Apollo anniversaries, is a wonderful way to remember the concerted national effort behind the amazing accomplishment," said Ellen Stofan, director of the National Air and Space Museum. The unveiling was timed to coincide with the 50th anniversary of the launch of the first crewed flight of the Apollo program. 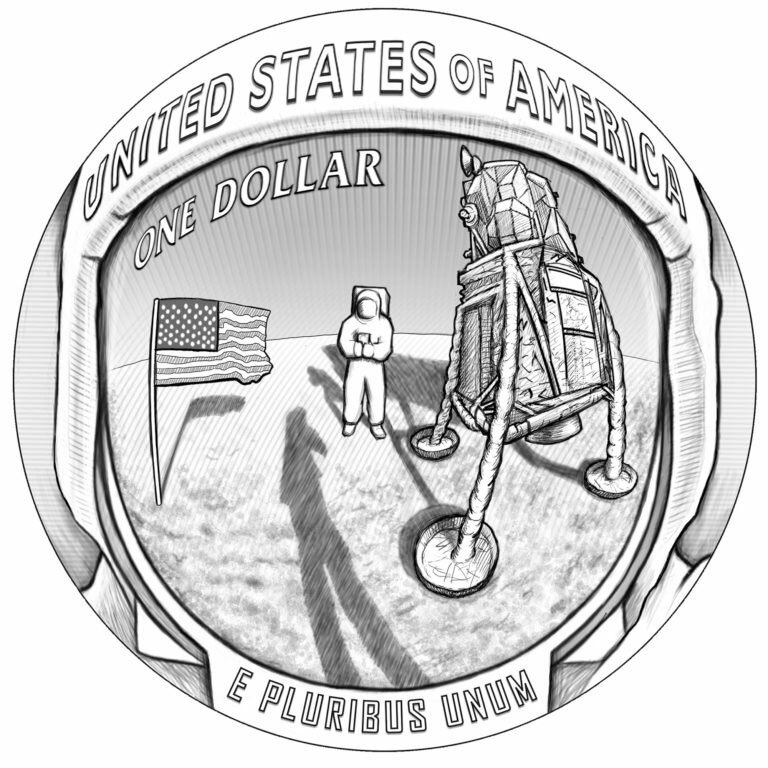 Apollo 7 astronaut Walt Cunningham, who flew with the late Wally Schirra and Donn Eisele on the 1968 test flight of the Apollo command and service modules in Earth orbit, helped with the coin's reveal. "Apollo 7 was a significant mission and to this day, 50 years later, it is still the longest, most ambitious and most successful of any test flight of any new flying machine ever," Cunningham said. "I hope we will be remembered for taking us one step closer to our first lunar landing." "It is my honor to help unveil a keepsake commemorating the Apollo program," Cunningham continued. "This coin celebrates the work of 400,000 Americans in what President Kennedy called 'the most hazardous, dangerous and greatest adventure' in which we have ever embarked. I hope that people who purchase this coin will be reminded of our achievements and the sacrifices that we were willing to make — and some people did make — in service to our country and to history." Joining Cunningham on stage for the unveiling was Cheryl Chaffee, daughter of the late Roger Chaffee, who with his two Apollo 1 crewmates died in a fire on the launch pad in 1967. Cheryl Chaffee took part in the ceremony as a representative of the Astronauts Memorial Foundation (AMF), one of three organizations that will benefit from the sale of the coins. "If the Apollo 11 commemorative is a total sell out, the program could raise in excess of $14.5 million," said Ryder. In addition to the AMF, which will receive one quarter of the total funds authorized by Congress to be paid, the Astronaut Scholarship Foundation (ASF) will receive one quarter and the National Air and Space Museum will receive the remaining half to help support the construction of its new "Destination Moon" gallery slated to open in 2022. 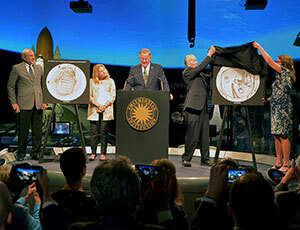 "The museum, the foundations and the Mint are all joined in a mission to support just the kind of achievements these coins celebrate," said Stofan. The Apollo 11 50th anniversary coins will be issued in January 2019 as a $5 gold coin, a $1 silver coin, a half dollar clad coin, and a five ounce $1 silver proof coin.